Having spent years as an in-house designer for such prestigious companies as Lenox (where she created the timeless design “Floral Fusion”) and Kathy Davis Studios, Stephanie had a calling and decided to branch out on her own. With the help of an agency, her business has grown significantly, and she has evolved her branding – “Petal and Light” encompassing her bright color, watercolor inspirational work, and her current art under the “Art + Alchemy” brand. Her goal is to change paint into expression, paper into art, and art into limited edition, handmade, purpose driven, high quality products for the “soul purpose” of connecting with the consumer. 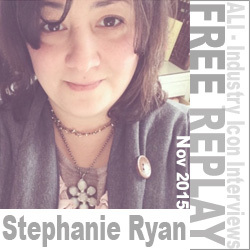 In this interview, Stephanie covers a gamut of topics from taking the leap to create her own brand, to finding her daily inspiration . . . from marketing herself through social media to the necessity of having digital skills in today’s marketplace.